Notes: Rates are age-adjusted. Deaths from homicide were identified using the International Classification of Diseases, Tenth Revision underlying cause of death codes *U01–*U02, X85–Y09, Y87.1. 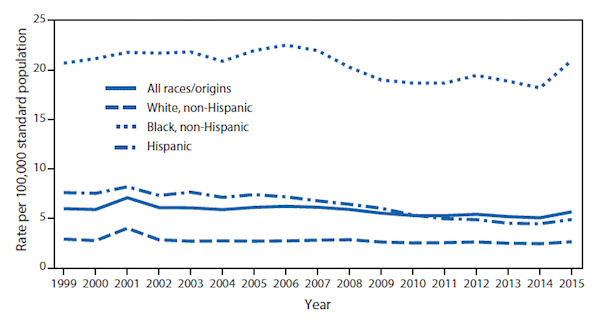 Data Source: CDC/National Center for Health Statistics, National Vital Statistics System, 1999–2015, Mortality. CDC Wonder online database. This entry was posted in Medicine and Society Data Watch on August 16, 2017 by Genevra Pittman.